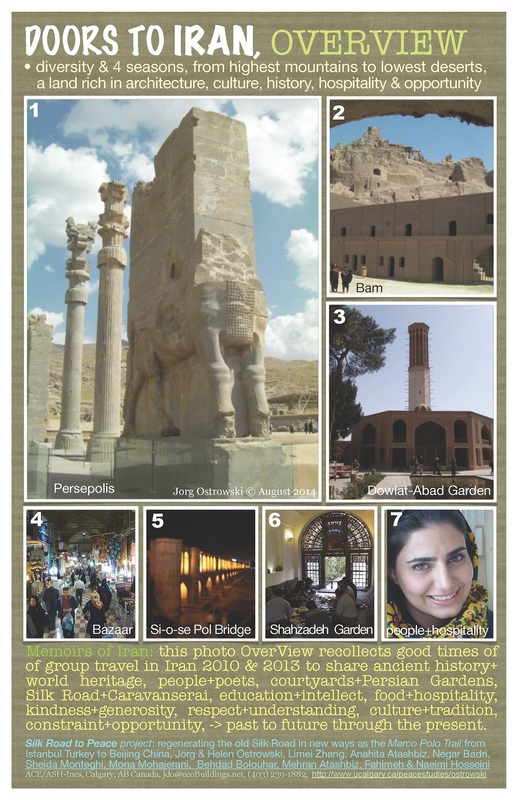 These 2 posters are the first of a series entitled, Doors to Iran, to summarize some of my conclusions from photos of our travels in Iran last fall. They are meant to be useful not only to us, but also to our audience with facts and names. The posters are meant to convey a message and use a group of photographs to complement or contrast each other to make a point, suggest a message and offer conclusions. So your comments would be useful. 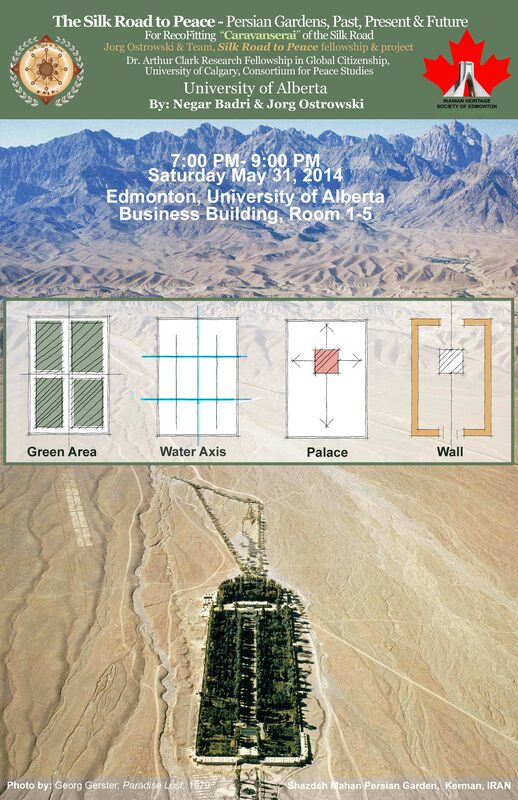 This presentation will span the ~3,000 year history of Persian Gardens from the past to the future, to bring meaning to Canadians in the present. Jorg Ostrowski (1) will first give background to the Silk Road to Peace project (1-5) take us on a short historical, archaeological and modern trip to several outstanding Persian Gardens that his international team visited last fall and conclude the presentation with a proposal and plan of action for a more sustainable future for all. A tiny and portable Persian Garden will be shown during the evening. 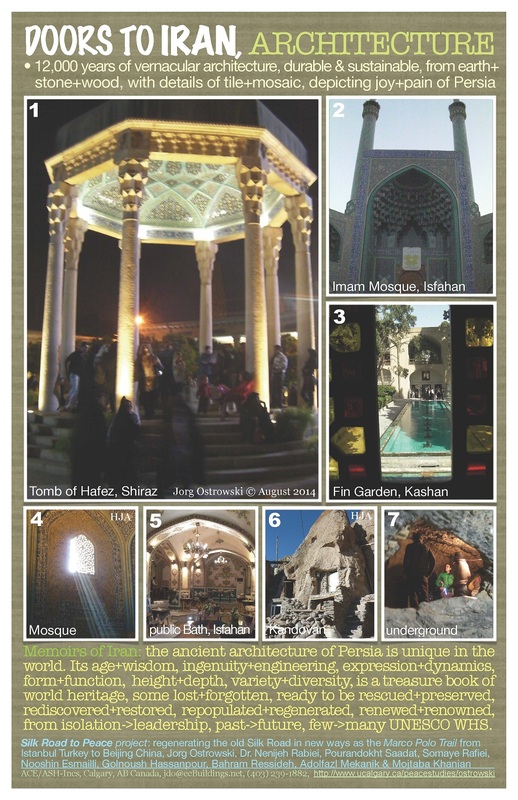 Ms. Negar Badri (2) will then outline the main elements in the pattern language of Persian Gardens in Iran, - its landscape design and architectural plans with references to various countries. She will also honour relevant work of others and give a glimpse of their work. Jorg has a Bachelor degree in Architecture from the University of Toronto. He did post graduate work at MIT in Boston. In 1972 he designed a brave new plan for a dilapidated Toronto Waterfront, transforming a brownfield into a "people place", based on recycling 40 ha of land and transplanting grassroots and pedestrian architecture. The federal government of Canada hired him as the first consultant to design future plans for what eventually became Harbourfront, one of the first sustainable and most successful waterfronts in North America. Elements of that plan, such as the multi-purpose trail and greenhouses, were transferred to initiatives in China and Iran. 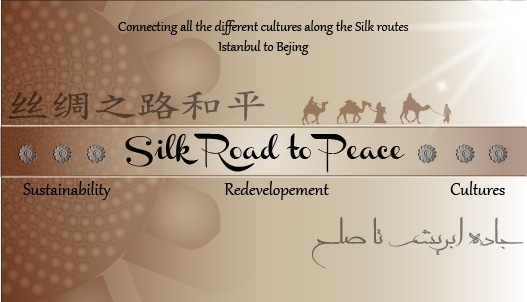 The Silk Road of Peace fellowship gave rise to a ~200 year project to recofit 2 to 6 caravanserai and Persian Gardens by 2020 and initiate and promote, plan and develop, the Marco Polo Trail, the longest heritage trail in the world, from Istanbul to Beijing. His work since 1972 has received public recognition through 6 awards, 130 articles (worldwide), 22 reports, 60 conference papers, 20 TV/Radio interviews, 300 partnerships, 5-demonstration projects and about 200,000 visitors. 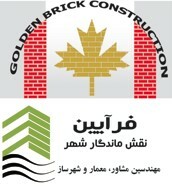 Ms. Bari has a Master degree in Energy and Architectural Engineering from Universities in Tabriz and Tehran, Iran. She is co-author of several papers on various topics, including energy efficiency, roof shapes, solar chimneys, ventilation, climate and vernacular architecture in Iran. 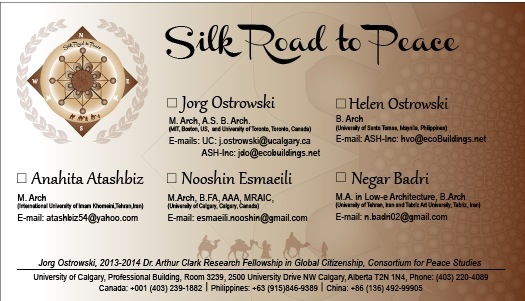 She has been working on the Silk Road to Peace project for 5 months, expanded the international team, and has given presentations on Caravanserai and Persian Gardens along the Silk Road in Iran, with other members of the team. Our firms ACE and ASH-Incs. were shortlisted last week by ScotiaBank's EcoLiving Awards program as 1 of 3 finalists in the Business Leadership category. Further, our work, and that of other good people, was recognized in their news release of this morning. Winners will be announced at a Gala Ceremony on June 5, World Environment Day, at the Art Gallery of Ontario. 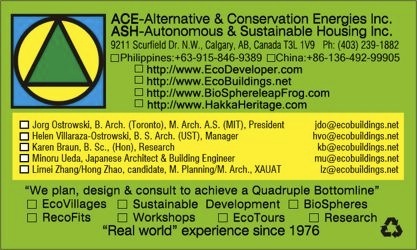 A video crew from Toronto will interview us, and we will give a tour of our ecoHome/Office on May 1 Thursday afternoon to invited guests. This video will be shown on June 5, at their Gala Celebration. Some of our design team members, clients, partners and friends of the environment and peace, will be on site, since they have been part of our story over the last 38 years of designing and building, consulting and giving talks/workshops on green buildings and sustainable (re)development. James Musselman, Stonehenge Digital Studios, Toronto is the video firm. If you have a healthy material, green product or alternative energy device you want us to try and demonstrate, or an opportunity to design an ecoPlus (surplus: safe drinking water, healthy earth & green clean energy) or "RecoFit" (ecological retrofit) project or community, please let us know. The lessons from our work are being applied now on a larger scale, - along the ancient Silk Road as we help others to preserve possible new world heritage sites and build peace, as can be seen in the Silk Road Blog and ecoCaravanserai at this site. The innovative planning and pattern language, architectural design and programs, ecological stewardship and habitat preservation, environmental strategies and performance, resource conservation and energy efficiencies, appropriate technologies and alternative energies, and our ecoPlus mandate are all being applied to Jorg's Dr. Arthur Clark Research Fellowship in Global Citizenship, which has evolved into a major transcontinental 100-200 year "RecoFit" project. We currently have a team of 30 people in 5 countries on 3 continents working on this project. The original submission to ScotiaBank is attached. on a donation basis. Details below. Program: Please bring slippers & sweater, dish & plate, cup & cutlery. "citizen action for better public policy and focus on what we can do in relation to climate change on both mitigation and adaptation policy which is woefully inadequate and misguided"
You are invited to the following 4 ecoEvents in Calgary, Edmonton & southern Alberta, as interest & eagerness, flexibility & availability move you. Please note changes to previous plans: April 19 been changed to April 26, on which date we will be celebrating our 20th earthBDay at the Calgary ecoHouse. Additional tours have been added below. RSVP is necessary for all events. Updates next week.